Cocoa plantations created by clearing away the rainforests create multiple environmental problems. February 5, 2016—Who doesn’t like chocolate? When we eat this delicious melt-in-your-mouth treat we want to enjoy it–not think about the environmental destruction connected with it or how it may be affecting our everchanging climate. My first reaction–NO! Not chocolate too! But alas–it seems so! To keep up with our sweet tooth demands, cocoa farmers have shifted from natural, sustainable farming to methods that are environmentally destructive, including clearing away the rainforests. Cocoa, the main ingredient in chocolate, is raw cacao that has been roasted at high temperatures. According to Wikipedia, cocoa farming can only take place 15 degrees north or south of the Equator, with West Africa being the biggest producer. The Ivory Coast produces 40% of the world’s cacao for chocolate. Other cacao producing countries are Ghana, Indonesia, Nigeria, Cameroon, Brazil, Ecuador, Mexico, Dominican Republic and Peru. The market value for the world’s chocolate for 2016 is approximately $98.3 billion–a huge industry that can also be corrupt, involving everything from child labor to smuggling. What is the environmental impact of our sweet tooth? Cacao is traditionally grown on small farms. 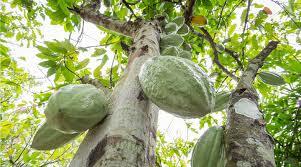 The trees that produce the beans grow naturally under the large leafy canopies of the rainforests, but many cocoa farmers have cleared away the rainforest to create cocoa plantations in the open sunlight, as it makes the pods easier to harvest. Training farmers in sustainable farming is the key to deforestation. Organizations such as the World Cocoa Foundation, Deforestation-Free Cocoa and Rainforest Alliance are attempting to return cocoa farming to its sustainable roots, planting the trees in their natural habitats underneath the broad leafs of the rainforest canopy. Even though rainforests are already cleared in many places, farmers can still be educated in ways to sustainably grow cacao, such as financing farmers on the condition they will not deforest further, ensuring fair labor and organic practices, and selling through a farmer’s coop that assures higher prices. 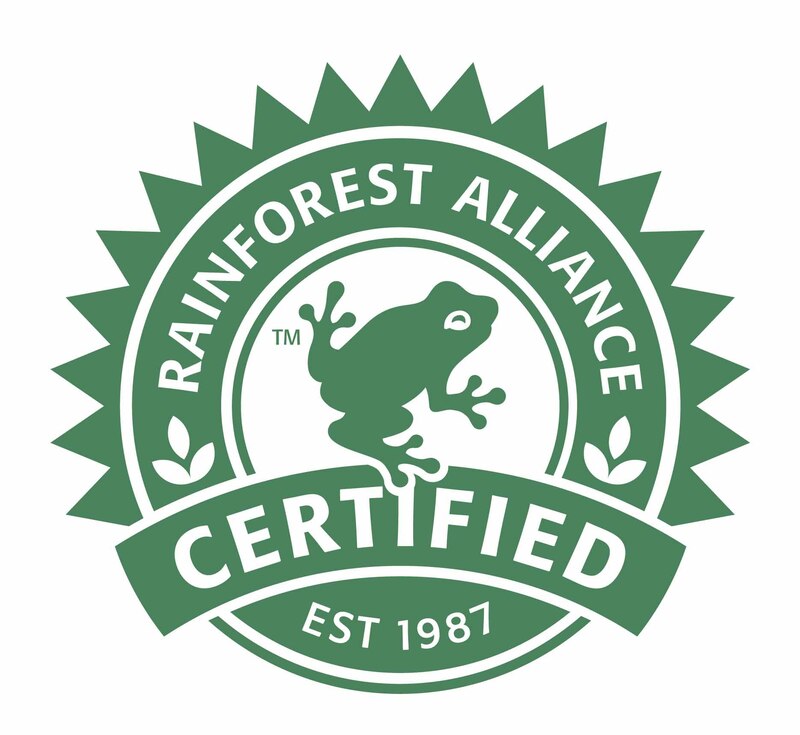 Rainforest Alliance brands are stamped with the little green frog on the wrapping! Some companies that use chocolate from Rainforest Alliance farmers are: Clif Bar, Dove Dark Chocolate, Dagobac, Hershey’s Bliss, NibMor. Protecting forests plays a key role in fighting climate change. Categories: Climate Change, Poverty, Rainforests, Renewable Resources, Sustainable Education | Tags: Climate change, cocoa production and chocolate, Rainforests, Renewable Resources | Permalink.